LATEST ISSUE: Fall/Winter 2013. 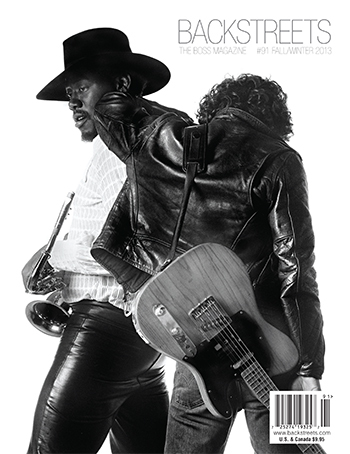 We honor the Big Man with one of our biggest issues ever: 116 pages, with more than half of them dedicated to the life and music of Clarence Clemons. The 65-page tribute section begins with Don Reo (Clarence's Big Man: Real Life & Tall Tales co-author and longtime friend) providing an exclusive, moving "Final Chapter" covering Clarence's last days. Little Steven produced a special episode of his Underground Garage radio show honoring the Big Man in the wake of his death, and we have the complete script here. After that, it's a massive memorial section, with remembrances by longtime friends, colleagues, and fellow musicians, including Robert Santelli, "Stormin'" Norman Seldin of the Joyful Noyze, Vini Lopez, Ernest "Boom" Carter, Mike Appel, J.T. Bowen, Narada Michael Walden, Branford Marsalis, Dale Maharidge, Jo Lopez, Who Do I Think I Am? director Nick Mead, and eulogies from Jake Clemons and Bruce Springsteen. We've also packed this tribute with stunning images spanning 40 years, from photographers including Eric Meola, Barbara Pyle, Frank Stefanko, Jim Marchese, Rene Van Diemen, Victoria Clemons, James Shive, James Appel, Michael S. Williamson, Teresa Psykaty-Lamicella, Joseph Quever, Guy Aceto, A.M. Saddler, Michael Zorn, and from archives including Billy Smith, Norman Seldin, Don Reo, Narada Michael Walden, and the personal collection of Clarence Clemons. The Clarence tribute section is, appropriately, massive. But it's not the only feature here. We also present "Because the Nightwatchman," the Backstreets Interview with Tom Morello, conducted by editor Christopher Phillips. Over two sessions, and 11 pages in the magazine, Tom discusses his relationship with Springsteen, the origins of his fandom, their work together live and on record, the similarities and differences between the Boss and the Nightwatchman, and the fact that Springsteen is, as Tom says, "the only friend I have who I also subscribe to a magazine about." PLUS: The impending High Hopes; our Q&A with Bruce author Peter Ames Carlin; a survey of nearly 80 Wrecking Ball reviews; the "On Disc" column's roundup of Springsteen releases from far and wide, including Wrecking Ball rarities and the new Released! series of Human Rights Concert recordings; the "From Asbury Park to the Promised Land" Rock and Roll Hall of Fame exhibit's move from Cleveland to Philadelphia; our interview with Carrie Potter, granddaughter of the Upstage's Tom Potter and author of For Music's Sake; plenty of "fan-based recordings" reviews and information from Fred Mills and Flynn McLean; and more. 116 pages, perfect bound, full-color. New subscriptions begin with this issue -- subscribe now for significant savings off the cover price, to eliminate shipping charges, and to automatically receive the issues to come!